New Delhi: Finance Minister Arun Jaitley has set aside Rs 200 crores in Budget 2014 for a giant statue of Sardar Vallabhbhai Patel in Prime Minister Narendra Modi's home state Gujarat. That is more than the new government's allocation for women's safety - Rs 150 crore for the safety of women in cities and Rs 50 crore for their safety on public transport. Rs 100 crore has been set aside for the "Beti Bachao, Beti Padhao" scheme for the girl child. Critics have questioned the Modi government's move to give the statue project as much importance as women's safety at a time India is struggling with an alarming spurt in crimes against women. Mr Jaitley said in his budget speech, "Sardar Patel stands as the symbol of the unity of the country. To support the Gujarat Government in this initiative to erect the Statue of Unity, I propose to set aside a sum of Rs 200 crore." Congress MP Shashi Tharoor tweeted, "NDA priorities: 100cr for "beti bachao/beti padhao" vs 200cr forPatel statue in Gujarat. 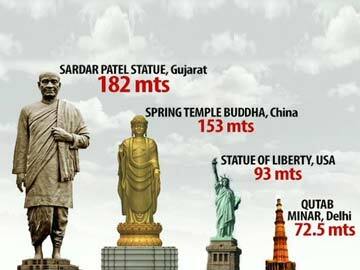 I suppose forBJP neither beti nor murti has a voice...."
Mr Modi, who ruled Gujarat for 13 years till he took over as PM in May, championed the project to build the 182-metre iron and bronze statue on an island off river Narmada. It is planned as the world's tallest statue, twice the size of the Statue of Liberty. Last year, Gujarat ministers and officials went on a mission to collect donations of cash and iron from across the country. A chunk of the Rs 2,500 crore project will now be funded by the Centre. The statue is seen to symbolize an unsubtle attempt by Mr Modi and his party to undermine the Congress and appropriate one of its independence-era icons. Sardar Patel was first Prime Minister Jawaharlal Nehru's deputy, his home minister and a lifelong Congressman. Mr Modi had said last year, "Had Sardar Patel been the first prime minister, the country's fate and face would have been completely different." A bristling Congress asked the 64-year-old politician to "read up his history" first.